This all-in-one tool fixes broken powder-based makeup! In a few easy steps, and with no drying time, you'll return crushed, shattered powders back to new. Use the enclosed magnetic palette to house your restored makeup. Bonus tip: fix broken lipsticks by melting them in a microwave-safe dish and pouring directly into the metal tins. Allow them to cool and harden before applying! 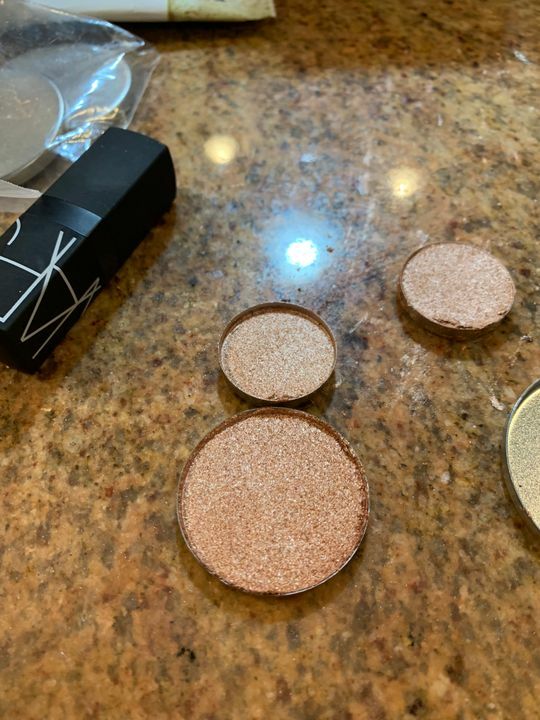 Charis H. Reviewed by Charis H.
I had a few shadows and a highlighter that were doomed for the trash but this put them back together again nicely! Great little product for those of us who love to use every last bit of our favorite color. You can take it out mix it up with something else create a new color for yourself or just add to an existing palette of your favorite color A+ in my book!! Eloiza D. Reviewed by Eloiza D.
Buy this now! It works! Shirin C. Reviewed by Shirin C.
I absolutely love this product. It is the best I have found for fixing makeup. Jayleigh C. Reviewed by Jayleigh C.
DIY in-a-box! Handy, but has its disappointments. So I've been repotting my eyeshadows, and it's been a messy scene. Trying to press powder evenly into pans was exhaustive, and finding a good binding agent was an elusive search- Alcohol wrecked most of my stuff. Clearly I NEEDED HELP. This thing is like a project in-a-box. Literally. It's plastic stackable parts that make a box. Includes a rubber press for 3 pan sizes, a screen for pulverisation and mixing, and a compartment of which the mix can be kept. So, yeah, it was easy as 1 -2-3! Best part was the binding fixative spray.. sort of. It doesn't make a perfectly even mix with good slip as it's basically a top coat of sorts. But it's better than making Mica Soup with alcohol. The pressing molds make beautiful pans though, and it's easy. The things I didn't like were: 1) the parts are really hard to clean!! 2) Fixative spray could be stronger. Other than that, it's a time saver!